Maybe I should be asking if you even have one, but then you might think that’s harsh. I’m guessing, though, that deep down inside you’ll admit to yourself what you’re doing is more fiction than fact… more a dream than a reality. Before you panic, take a deep breath and get your heart rate back down to 72 and know many of the things you’re doing are working, even if you don’t think so. What’s happening is you do have a few things that are not working and they’re overpowering what is working. I’m excited to be part of an upcoming webinar you won’t want to miss. 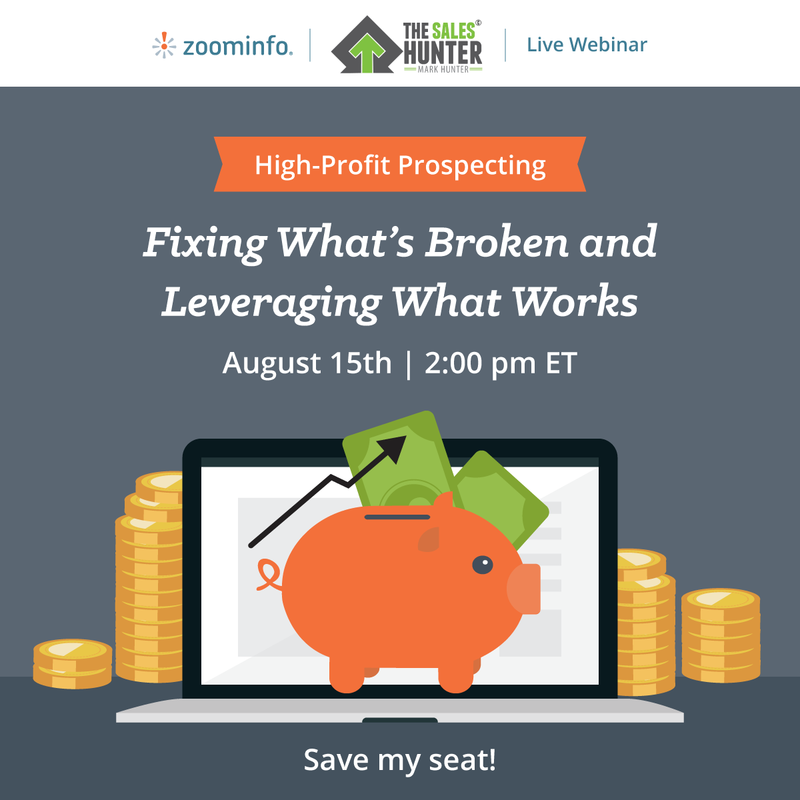 It’s all about this very topic — fixing what’s broken and leveraging what works in your prospecting process. You can find out more at this link or click on the below image. You have to realize whether you’re in a team of 20 salespeople or selling on your own, there are two fundamentals that have to be right and they are your mind and a system you can follow. Could you imagine flying an airplane without a system or process you could follow? No, there’s no way you could. Same goes for your mind. Would you want fly on a plane piloted by a 2-year old? No, they simply don’t have the mind to fly. Same with sales — as big as getting the mind right is, an even bigger part is the getting the process right. Your customers have changed far more than you realize, and worse yet, the sales process you’re using was built for a different era. Back to my airplane analogy — the process you’re using was built for a Boeing 727, but you’re dealing in a world of Boeing 787s. It is simply not going to work. What is the % of leads that ultimately turn into customers? Don’t overcomplicate things. When you know the answers to these two questions and you can answer the following five questions, you’ll then be able to determine the mechanics that will make your process work. Why do customers buy from me? Why do customers choose to not buy from me? Who is my best customer and why? What are the outcomes I provide my customers? You can fix what’s broken and leverage what works in your prospecting process. To find out more, be sure to sign up for the upcoming webinar at this link or by clicking the below image. PrevPreviousProspecting: Are You Asking for Referrals?